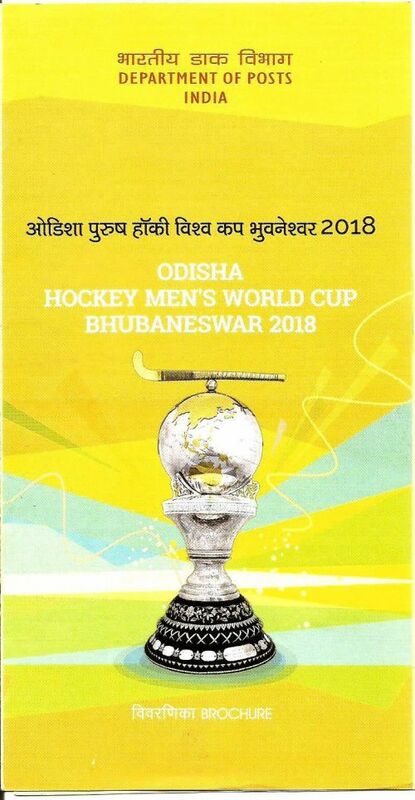 The 14th edition of Men’s World Cup Field Hockey known as Odisha Hockey Men’s World Cup Bhubaneswar 2018 is being held from 28 Nov 2018 to 16 Dec 2018 at Kalinga Stadium Bhubaneswar in Odisha India. The stadium has a capacity of around 15,000. 16 Teams are participating in the tournament. The teams have been divided into four groups and a total of 36 matches would be played over a span of 19 days. India is hosting the World Cup for the third time after Mumbai 1982 & Delhi 2010. The Netherlands is the only other nation to have hosted the World Cup thrice. India has issued five stamps on this event. An odd shaped miniature sheet has been released by India Post on 27 Nov 2018 to commemorate this event. The miniature sheet is in the shape of an Olive Ridley turtle. The stamps feature The World Cup Trophy and the players with hockey sticks in different phases of the Game. One of the stamps also features the mascot “Olly” which represents the Olive Ridley Sea Turtles. 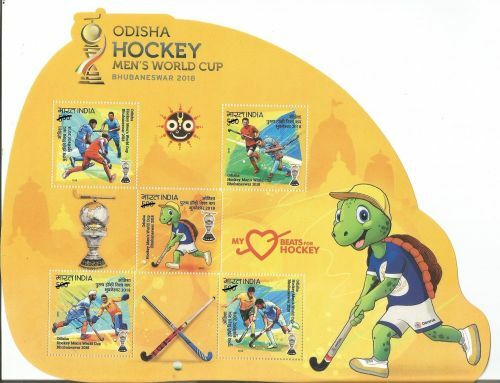 The mascot "Olly" is featured playing hockey on one of the five rupees stamps. The Olive ridley sea turtles nest in two or three large groups near Gahirmatha in Odisha. The coast of Odisha is the largest mass nesting site for Olive Ridleys. Lord Jagannath, avatar of Vishnu is also featured on the miniature sheet. All five stamps are of Rupees five denomination. 503900 stamps have printed and 1,30,000 Miniature Sheets have been printed. The stamps have been by the Wet Offset printing process and have been printed at The Security Printing Press at Hyderabad.